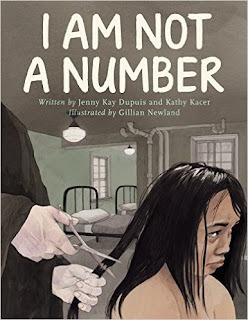 Jenny Kay Dupuis and Kathy Kacer's I Am Not A Number, illustrated by Gillian Newland and due out from Second Story Press on October 4th of this year (2016), is one of the books I will recommend to teachers and librarians. Dupuis is a member of the Nipissing First Nation. In 1928, Dupuis's grandmother, Irene Couchie Dupuis, was taken to a residential school in Canada. "Residential" is the term used in Canada for the schools created by the Canadian government. They are similar to the government boarding schools in the U.S. These were schools designed to "christianize" and "civilize" Native children. Some of them were mission schools where efforts were made to convert the children to whatever denomination ran the school. I Am Not A Number opens with a frightening moment. An Indian agent is at their door, to take Irene and her brothers to residential school. When Irene's mother tries to keep Irene, the agent says "Give me all three or you'll be fined or sent to jail." Irene's parents, like many Native parents, were coerced into giving up their children. When Irene arrives at the school and tells the nun (it is a mission school run by the Catholic Church) her name, she's told "We don't use names here. All students are known by numbers. You are 759." Irene thinks to herself that she is not a number, hence, the title for the book. Her hair, as the cover shows, was cut. That happened to children when they arrived at the schools. It was one in a long string of traumatic moments that Native children experienced at residential or boarding schools. Another was being punished for using their own language. At one point, Irene gives another girl a piece of bread. The girls speak briefly to each other in their language, Ojibwe. One of the nuns hits Irene with a wooden spoon, telling her "That's the devil's language." The nun drags Irene away for "a lesson." The lesson? Using a bedpan filled with hot coals to burn Irene's hands and arms. It was one kind of abuse that children received, routinely. Irene's story ends on a different note than many of the residential and boarding school stories. She and her brothers go home for the summer. What she tells her parents about her time at the school moves them to make plans so that Irene and her brothers don't go back. 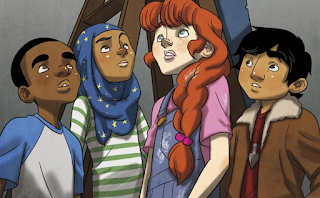 When the agent shows up in the fall, the children hide in their dad's workshop. The agent looks for them, but Irene's dad challenges the agent, saying "Call the police. Have me arrested." In a low, even voice, he tells the agent that he (the agent) will never take his children away again. In the Afterword, Dupuis writes that her grandmother was only at the school for that one year. Her father's resistance worked. She was able to stay home, with her family. Residential and boarding school stories are hard to read, but they're vitally important. In the back matter, Dupuis and Kacer provide historical information about the residential school system. They reference the report the Truth and Reconciliation Commission (the TRC) released in 2015, too. The work of the TRC is being shared in Canada, and books like I Am Not A Number should be taught in schools in Canada, and the U.S., too. In my experience, schools don't hesitate to share stories of "savage Indians" who "massacre" those "innocent settlers." In fact, the Native peoples who fought those settlers were fighting to protect their own families and homelands. Depicting them as aggressors is a misrepresentation of history. The history of the US and Canada is far more complex than is taught. It is way past time that we did a better job of teaching children the facts. I'll end with this: I'm thrilled whenever I see books in which the author/publisher have opted not to use italics for the words that aren't English ones. There's no italics when we read miigwetch (thank you) and other Ojibwe words in I Am Not A Number. Kudos to Second Story Press for not using italics. Update on Sep 24, 2018: I (Debbie), shared this post on Twitter yesterday, because I was critiquing a young adult novel in which the author cited Island of the Blue Dolphins as a significant book from her childhood. Dr. Eve Tuck read my tweet, this post, and responded. Dr. Tuck is Aleut, and is an Education professor who has served as editor of NCTE's English Journal. See her article, Decolonization is not a metaphor, and her books, listed at her website. With her permission, I am adding her response to my tweet and article. They are at the bottom of this post. "A Critical Look at O'Dell's Island of the Blue Dolphins"
Scott O'Dell's Island of the Blue Dolphins is set on San Nicolas Island, a small island off the coast of Santa Barbara California. In the Author’s Note at the back of the book, O’Dell writes that “[t]he girl Robinson Crusoe whose story I have attempted to re-create actually lived alone upon this island from 1835 to 1853, and is known to history as The Lost Woman of San Nicolas” (p. 187). Because nobody could understand her language, her given name is not known. Named Juana Maria by the Mission priest who took her in at Santa Barbara Mission, she died six weeks after her rescue. To anthropologists, the people of the island are known as Nicoleños. In his story, O’Dell changes Juana Maria’s status to a twelve-year old girl named Karana. As the story opens, Karana and her little brother Romo are digging roots when a ship arrives. On board is a Russian captain named Orlov who has come with forty of his (Aleut) men to hunt sea otter. Based on past experiences, Chief Chowig (Karana’s father) and Orlov have a tense discussion about what the Ghalas-at will receive in return for the otters that will be taken from the waters that abut the island. Months later when Orlov readies to leave without holding up his end of the bargain, a fight breaks out. Most of the men of Ghalas-at, including Chowig, are killed. Two years later, the survivors are rescued. After the rescue ship leaves the cove, Karana realizes Romo is not on board. She jumps ship to stay with him and wait for another rescue ship. Soon after, wild dogs kill Romo, and Karana is alone until her rescue. Her years on the island make survival a central theme of the story. During that time, she builds several shelters, makes weapons that only men are supposed to make (according to tribal traditions), finds food, fights wild dogs, befriends a large dog that she thinks came to the island with the Russian ship and then when he dies, tames a wild dog that she thinks was fathered by the large dog. 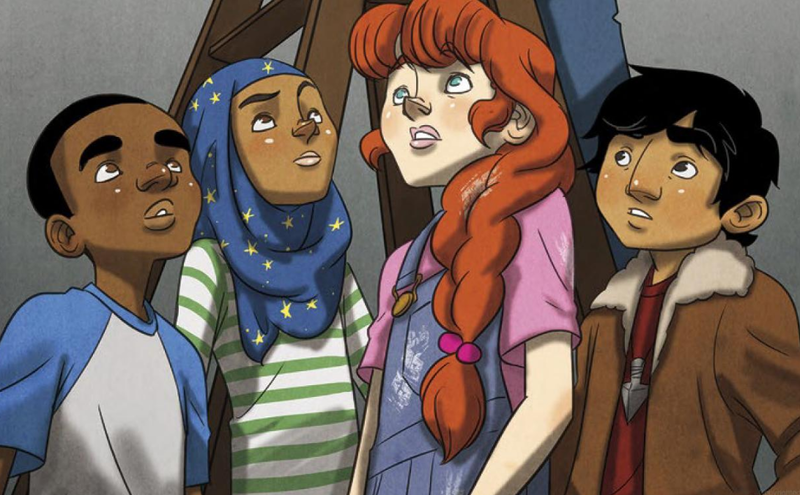 She survives an earthquake, a tsunami, and several harsh winter storms. At the close of the story, she is leaving the island. Based on the text, she has been there at least four years. On page 162, the text reads that two years have passed since the Aleuts had been on the island. At that point, Karana stopped counting the passage of time. One spring, there is an earthquake. As she makes a new shelter, she sees a ship and at first, she hides from the two men who come ashore. She decides she wants to be with people again, and rushes down to the cove but the canoe is gone. Two years pass and a ship returns. This time, she doesn’t hide. When the ship leaves, she is on board with her dog and two caged birds. Born in Los Angeles, California in 1898, O’Dell died in 1989. He spent the first thirty years of his adult life working in Hollywood as a cameraman and writer. In 1920, a California newspaper misprinted Odell Gabriel Scott’s name as Scott O’Dell. Liking the misprint, Scott legally changed his name and from then on, was known as Scott O’Dell. In 1947, he became the book editor for the Los Angeles Daily News (Payment, 2006). In addition to his writing, O’Dell spent time with his father on his orange grove ranch, where he visited ranches of Spanish families of the Pomona Valley and listened to their stories of the past. This led him to write three novels for adults, and a history of California. In 1957, O’Dell published Country of the Sun: Southern California, An Informal History and Guide. Therein, he references Helen Hunt Jackson’s articles, published in 1882 in Century Magazine, about the mistreatment of the Cupeno Indians of California. He also references her novel, Ramona, published in 1884, saying her novel “had about the same impact as Uncle Tom’s Cabin. Overnight, the country was aroused to the plight of the Southern California Indian” (p. 52). Country of the Sun includes two pages about “The Lost Woman of San Nicolas Island”. O’Dell developed the story into a book-length manuscript and showed it to Maud Lovelace (author of the Betsy-Tacy books). She persuaded him “that it was a book for children, and a very good one” (Scott O’Dell, n.d.). Lovelace penned the biography for O’Dell when he won the Newbery Medal for Island of the Blue Dolphins. She concludes the biography with “Scott O’Dell’s life brought him naturally a knowledge of Indians, dogs, and the ocean; and he was born with an inability to keep from writing. So he gave us the moving legend of Karana” (p. 108). In his acceptance speech, O’Dell referenced animal cruelty and forgiveness as themes that are present in his book. He also spoke at length of Antonio Garra, a Cupeno Indian man who, just before he was executed under bogus charges, said “I ask your pardon for all my offenses, and I pardon you in return” (O’Dell, p. 103). O’Dell went on to say that this man, of a peaceful tribe, is unknown to the world because he was peaceful rather than “like Geronimo” (p. 103). Karana, he said, belonged to a tribe like Garra’s. He concluded his speech saying that Karana, before her people were killed, lived in a world where “everything lived only to be exploited” but that she “made the change from that world” to “a new and more meaningful world” because she learned that “we each must be an island secure unto ourselves” where we “transgress our limits” in a “reverence for all life” (p. 104). Island of the Blue Dolphins received glowing reviews and went on to win the Newbery Award. It was made into a movie in 1964 and has since been made into audio recordings several times. The National Council of Teachers of English listed it on its “Books for You” in 1972, 1976, and 1988. In 1976, the Children’s Literature Association named it one of the ten best American children’s books of the past 200 years (O’Dell, 1990). It is the subject of numerous amateur videos on YouTube and there are volumes of lesson plans written for teachers. Over the years, the cover has changed several times. As of this writing, it has 734 customer reviews on Amazon.com. Thirty-three readers gave it one star, while over 600 gave it four or five stars. In 1990, Island of the Blue Dolphins was republished, with illustrations rendered by Ted Lewin, and an introduction by Zena Sutherland. A fiftieth anniversary edition was published in 2010, with a new introduction by Lois Lowry. She showers O’Dell’s novel with praise, noting that he “masterfully” brings the reader onto the island (O’Dell, 2010). In 2010, School Library Journal blogger Elizabeth Bird listed it as one of the Top 100 Children’s Novels (Reese, 2010). In 2010, the book was listed in second place on Amazon’s list of “Bestsellers in Children’s Native American Books” (Reese, 2010). In the academic literature, Maher (1992) writes that Island of the Blue Dolphins is a “counterwestern” that gives “voice to the oppressed, to those who lost their lands and their cultures” (p. 216). Tarr (1997) disagrees with that assessment, asserting that the reader’s uncritical familiarity with stereotypical depictions of American Indians is the reason it has fared so well. Moreover, Tarr (2002) writes that the stoic characterization of Karana and her manner of speaking without contractions are stereotypical Hollywood Indian depictions rather than one that might be called authentic. Placing the novel in a social and historical context gives depth to Tarr’s statement and also explains why it is so popular. In the years preceding the publication of Island of the Blue Dolphins, America was enjoying the heyday of Hollywood Westerns that depicted savage Indians who terrorized settlers and captured their women, and heroic White men who courted Indian maidens and bemoaned the way Indians were treated by Whites. John Ford’s Stagecoach (1939) follows a stagecoach of travelers who must be mindful of Indian attacks. Broken Arrow (1950) featured Jimmy Stewart as a man in love with an Apache girl and who, out of love and sympathy, tries to help make peace between the Apaches and the U.S. troops. In The Searchers (1956), John Wayne plays the role of a man on the search for a White girl who had been abducted by Indians. Some of the research that went into Country of the Sun reappears in Island. Presumably, O’Dell conducted his research during the 1950s. That decade was a devastating time for several American Indian nations, a time during which their identity as sovereign nations was again under government attack. It is useful to review how they came to be known as sovereign nations. From the moments of their arrival on the continent now called North America, Europeans encountered well-ordered nations or tribes of Indigenous peoples, each with its own territories and forms of governance. Recognition of that nationhood is evident in the treaties European heads of state made with their counterparts amongst the 500+ sovereign Indigenous nations (Deloria and DeMallie, 1999). In the treaties, lands were ceded to the United States in return for federally provided health care, housing, and education. As time passed, various entities wanted to nullify the treaties, thereby discontinuing federal funding to tribes and making available lands held by tribes. Desire for land, coupled with the rampant corruption within the Bureau of Indian Affairs that had federal oversight for the tribes, led Congress to terminate its nation-to-nation relationship with the tribes through a policy outlined in House Concurrent Resolution 108 (Wilkinson and Biggs, 1977) that led to several public laws enacted by Congress, including the California Rancheria Termination Act (Public Law 85-671). Through the Termination period (1953-1962), over one hundred bands, communities, and rancherias (California Mission Indians) in California were terminated (Nies, 1996). Given his care to include mistreatment of California Indians in the 1800s, it is curious that O’Dell does not reference any of the Terminations in Country of the Sun. As noted, Island of the Blue Dolphins is based on the life of Juana Maria. At the time of his research, the resources he had available to him about Juana Maria were newspaper accounts and articles about her. Emma Hardacre’s “The Lone Woman of San Nicolas Island” was first published in Scribner’s Monthly in 1880, and then again in 1950 and 1973. Hardacre begins by noting that Robinson Crusoe is a work of fiction, whereas the story of the Lone Woman of San Nicolas Island was true. In Santa Barbara, people spoke less and less about the “widow, between twenty and thirty years of age” who leapt from the ship to be with her child who had accidentally been left behind (p. 75). found the remains of a curious hut, made of whales’ ribs planted in a circle, and so adjusted as to form the proper curve of a wigwam-shaped shelter. This he judged to have been formerly either the residence of the chief or a place of worship where sacrifices were offered. He had picked up several ollas, or vessels of stone, and one particularly handsome cup of clouded green serpentine. More interesting to Jeffries was the abundance of sea otter. Soon after his return to the mainland, he returned to the island with George Nidiver and a crew of Indians on an otter hunt. For six weeks, they hunted seal and otter. Leaving the island, a sailor said he thought he saw a human figure calling to them, but the figure vanished. On their third trip to hunt at the island, Nidiver saw a footprint and exclaimed that the woman was alive. The next day, Nidiver found a basket that contained “bone needles, thread made of sinews, shell fishhooks, ornaments, and a partially completed robe of birds’ plumage, made of small squares neatly matched and sewed together” (p. 279). In their search of the inland, they found “several circular, roofless inclosures [sic], made of woven brush. Near these shelters were poles, with dried meat hanging from elevated crosspieces” (p. 279). Not finding the woman, they determined the footprint was older than they thought, and some thought that she was probably dead. Fishing continued for several weeks. Nidiver believed she might be alive and hiding and decided to look until he found her or her remains. instantly controlling herself, stood still, and addressed him in an unknown tongue. She seemed to be between forty and fifty years of age, in fine physical condition, erect, with a well-shaped neck and arms and unwrinkled face. She was dressed in a tunic-shaped garment made of birds’ plumage, low in the neck, sleeveless, and reaching to the ankle. She greeted the other men and then set about preparing a meal for them that consisted of roasted roots. Through gestures, they communicated that she was to go with them. She understood immediately and put her things in pack baskets. On board their ship, Brown wanted to preserve her feather dress, and so made her a petticoat of ticking. He gave her a man’s cotton shirt and a neckerchief. She watched Brown closely as he sewed, and showed him how she used her bone needle to puncture the cloth and then put thread through the perforations. Through gestures, she told Brown of her years on the island, how she made fire “by rapidly rubbing a pointed stick along the groove of a flat stick until a spark was struck” and that she was careful not to let it go out, covering her home fire with ashes to preserve it. She ate fish, seals’ blubber, roots, and shellfish, and she used bird skins for clothing. Her main dwelling was a large cave on the north end of the island. On arrival in Santa Barbara, people flocked to Nidiver’s home to see her. Through gestures, she told Nidiver’s wife that dogs had eaten her baby and how she grieved its loss. She also communicated her dread of being alone, her years of hope for rescue, and at last, resignation at being alone. Nidiver was unable to find anyone amongst the Indians in the Missions who could understand her language. They learned some of her words: “A hide she called to-co (to-kay); a man, nache (nah-chey); the sky, te-gua (tay-gwah); the body, pinche (pin-oo-chey)” (p. 283). She was so gentle and modest that some believed she was not an Indian, but “a person of distinction cast away by shipwreck” (p. 283). She got weaker and weaker and when she was near death, Nidiver’s wife asked Father Sanchez to baptize her. He did so, giving her the name Juana Maria. She was buried in a walled cemetery and the mission fathers “sent her feather robes to Rome. They were made of the satiny plumage of the green cormorant, the feathers pointing downward, and so skillfully matched as to seem one continuous sheen of changeful luster” (p. 284). O’Dell may have read a study published in an archeological journal in 1953. Meighan and Eberhart’s study stated that “ethnographically, almost nothing is known of the tribe” and that there was a “virtual absence of trade goods, in particular glass beads” (p. 109). They reference the possessions of the woman as follows: “a well made sinew rope 25 feet long and one-half inch in diameter, thought to have been used in snaring sleeping seals” and, “sinew fishing line; bone and abalone shell fishhooks; bone needles; bone knives, and a knife made of a piece of iron hoop stuck in a rough wooden handle” (p. 112). Items found on the island include mats and skirt fragments made of eel grass, grass skirts, woven bags, woven baskets, stone knives with wooden handles, a stone drill with a wooden handle, wooden knife handles, a wooden ladle, an arrow shaft, a wooden dark foreshaft with bone bars, a drill with wooden shaft and stone point, harpoon points, a great many mortars and pestles, steatite dishes and bowls, stone beads and pendants, bird and sea-lion claws used as pendants, stone ground spoons and ladles . Meighan and Eberhart report four Nicoleno words: “tokay (hide), nahchey (man), taygway (sky), and pinoochey (body). Bird bones were used to make beads, whistles, awls, and fishhooks. Fish and shellfish were the primary source of food, including abalone, rock scallops, mussels, limpets, and sea urchins. Clearly, these two key sources say little was known about the people of Ghalas-at and the woman at the heart of O’Dell’s novel. And yet, he was able to write a novel of 186 pages. With this survey of the source material of that time, I turn to a close read of specific passages from the story. In the following table, the left column contains a selection of material from the story. In the right column are notes specific to the information in the left column. Some of the passages are not addressed in the Discussion following the table; they are retained in the table for further research. “I” is Karana. On page 12, O’Dell tells us the name of the island: Ghalas-at. The Aleut’s are an Indigenous people from what came to be known as Alaska. During the time of the novel (1835), the Aleuts were enslaved by Russians and forced to hunt sea otters (Pullar, 1996). Writers often use the cliché “many moons ago” when writing from an Indian point of view. Though it is obvious that people who do not speak English would have words in their language for sun or moon or the passage of time, the “many moons ago” idiom, inserted into the mind/mouth of any Native character obscures the diversity of language. When Romo sees the Aleut ship, he describes it as “a small cloud” (p. 10). In Country of the Sun, O’Dell recounts a Cahuilla legend, “The Lost Spanish Galleon” (p. 147) that begins with Cahuilla men seeing a Spanish galleon and thinking it was a cloud. As Orlov comes ashore, “Half the men from our village stood at the water’s edge. The rest were concealed among the rocks at the foot of the trail, ready to attack the intruders should they prove unfriendly” (p. 12). In Country of the Sun, when the Spanish galleon is sighted, O’Dell writes “The Cahuillas hid themselves behind rocks along the shore” and their chief “cautioned his people to remain hidden” (p. 148). When Captain Orlov comes ashore and begins negotiations with Karana’s father who is chief of the people at Ghalas-at, Karana is surprised that her father gives Orlov his seldom used and secret “real” name (Chowig) because “if people use your secret name it becomes worn out and loses its magic” (p. 13). Look for: Names and their power. “Karana” is the protagonists’ secret name. Her common name is “Won-a-pa-lei” which means “The Girl with the Long Black Hair” (p. 13). The translation does not make sense, given the likelihood that all the girls would have long black hair. The Aleuts come ashore, and Karana sees “a tall man with a yellow beard” (p. 12). In Country of the Sun, Yuma Indians and a “bearded” Spanish captain come ashore (p. 148). The night Orlov arrives, her father “warned everyone in the village of Ghalas-at against visiting the camp. “The Aleuts come from a country far to the north,” he said. “Their ways are not ours nor is their language” (p. 17). From O’Dell’s Country of the Sun: The night the Spanish came ashore, “Darkness fell and the Cahuillas went silently back to their village and held council far into the night. The older men, who had heard tales of Spanish greed and ferocity, were in favor of abandoning the village and taking the women and children into the mountains. But the younger men, proud of their heritage as warriors and jealous of it, prevailed” (p. 148). They lay plans for an attack. Each night, people in the tribe “counted the dead otter and thought of the beads and other things that each pelt meant” (p. 23). Karana does not like the slaughter of the otters she regards as friends she would have fun watching as they played. “It was more fun than the thought of beads to wear around my neck” (p. 23). This is O’Dell’s first mention of beads. Presumably, the negotiations that took place when Orlov landed included beads but this was not specified. In Country of the Sun: The next morning, the Spanish gave each of the Indians “a handful of beaded trinkets” (p. 149). The beads story works because it plays on the idea that Indians are not smart enough to know that their land and resources aren’t worth more than beads. Williams’ analysis of Dutch, Manhattan, beads is excellent. Karana’s father sends young men “to the beach to build a canoe from a log which had drifted in from the sea” (p. 24). Kroeber: Canoes “may have been burned from drift logs” (p. 634). The archeological record (Kroeber/Meighan & Eberhart) does not list sparkly beads recovered on San Nicolas Island. Items Karana has in a basket she carries onto the rescue ship: “three fine needles of whalebone, an awl for making holes, a good stone knife for scarping hides, two cooking pots, and a small box made from a shell with many earrings in it” (p. 42). References to these items are in the historical record. Karana’s sister, Ulape, “had two boxes of earrings, for she was vainer than I, and when she put them into her basket, she drew a thin mark with blue clay across her nose and cheekbones. The mark meant that she was unmarried” (p. 42). An assumption that Karana and her people had the same ideas of beauty (vanity) that O’Dell did. After she leaps off the boat and is back on shore, “The only thing that made me angry was that my beautiful skirt of yucca fibers, which I had worked on so long and carefully, was ruined” (p. 47). An assumption that Karana and her people held the same ideas of beauty that O’Dell did. Romo declares that, as son of Chowig, he is now Chief of Ghalas-at. Karana replies that before he can be the chief, he must become a man: “As is the custom, therefore, I will have to whip you with a switch of nettles and then tie you to a red ant hill” (p. 51). Romo has “a strong of sea-elephant teeth which someone had left behind” (p. 50). Meighan references sea-lion claws used as pendants. Thinking the chest Orlov left may have an iron spearhead, Karana digs up the chest and finds it “filled with beads and bracelets and earrings of many colors” (p. 59). There are no spearheads in the chest. Reference to beads draws on “primitive” (stupid) Indians who sold Manhattan for beads. Karana “wondered what would happen to me if I went against the law of our tribe which forbade the making of weapons by women—if I did not think of it at all and made those things which I must have to protect myself” (p. 61). “There was a legend among our people that the island had once been covered with tall trees. This was a long time ago, at the beginning of the world when Tumaiyowit and Mukat ruled. The two gods quarreled about many things. Tumaiyowit wished people to die. Mukat did not. Tumaiyowit angrily went down, down to another world under this world, taking his belongs with him, so people die because of him” (p. 82). This story, from the Cupeno Indians, appears in Country of the Sun in “Revolt in the Mountains” as follows: “One of the most dramatic and current [myths of creation], as recounted by Salvador Cuevas, a Luiseno, has the world and everything in it created by the gods Tumaiyowit and Mukat. The gods quarreled and argued about their respective ages. They disagreed about many things. Tumaiyowit wished people to die. Mukat did not. Tumaiyowit went down, down to another world under this world, takig his belongings with him, so people die because he did” (p. 47). It is also in Kroeber’s Handbook, on page 692. None of these words are in Kroeber or Hardacre. O’Dell had little to go on in creating the worldview of Karana and her people. To flesh out the story, he inserted his prior research on other California tribes, inserting their ways into the Nicoleno tribe, as though one peoples’ way of being was interchangeable with another. O’Dell wrote Island of the Blue Dolphins prior to the development of multicultural literature and the attention to specificity, so it may be appropriate not to judge him too harshly for doing it. He also drew from popular stereotypes and clichés of American Indians, including the stories in which American Indians traded their land for a string of beads. An American embrace of stereotypes and clichés led to—and guaranteed—the success of the novel. Island of the Blue Dolphins is a lot like most books and media about American Indians that give the audience the kind of Indians that America loves to love (Shanley, 1997). O’Dell gave us both: the savage ones (the Aleuts), and the gentle ones (Karana’s people). In a spirit of generosity, it is possible to justify why his story met with such success but how do we justify an embrace of it in the present time, when we know so much more about accuracy and authenticity of representation? And why do even our leading scholars fail to step away from the book? For example, in her introduction to the illustrated version, Zena Sutherland conflated the story of Juana Maria with the fictional story of Karana. She incorrectly refers to the Lost Woman as Karana, instead of Juana Maria. She says that she was twelve years old (Juana Maria was a mother, not a child), and that Karana’s brother died on the island (Juana Maria’s child died). The real person is lost in the embrace of the fiction character, Karana. Is sentiment in the way? There is a fascination, a nostalgia, and a yearning for the romantic Indian and all that “Indian” means to people who think the best life anyone could have is one of the Indian of yesteryear, living in the pristine wilderness, where the weight of the world is not on your shoulders, where you can breath clean air, and drink clean water. This nostalgia also captures the imaginings of the perfect childhood, but neither one is—or was—real. As such, Island of the Blue Dolphins is a perfect example of a book at the center of the canon of sentiment (Stevenson, 1997). Indeed, the canon of sentiment “exists to preserve—to preserve the childhood of those adults who create that canon and to preserve the affection those adults feel for the books within it” (p. 113). A good many adults imagine the childhood O'Dell described and the survival that Karana experienced. We like to think we could survive, too, and a story like this one lets us see how that could happen. Nonetheless, the story is lacking in its accuracy and suitability for informing children about American Indians. Will there come a time when there is a critical mass of gatekeepers rejecting works like this? I hope so. Sentiment is no excuse for ignorance. Deloria, V. and DeMallie, R. J. Documents of American Indian Diplomacy. Norman: University of Oklahoma Press. Hardacre, Emma. (1971). The Lone Woman of San Nicolas Island. The California Indians: Source Book, edited by R. F. Heizer and M. A. Whipple. Berkeley: University of California Press, 272-281. Kroeber, A.L. (1925). Handbook of the Indians of California. Washington DC: U.S. Government Printing Office. Maher, S. N. (1992). Encountering others: The meeting of cultures in Scott O’Dell’s Island of the Blue Dolphins and Sing Down the Moon. Children’s Literature in Education, 23(4), 215-227. Meighan, C.W. and Eberhart, H. (1953). Archaeological resources of San Nicolas Island, California. American Antiquity, 19(2), 109-125. Nies, J. (1996). Native American History. New York: Ballantine Books. O’Dell, S. (1957). Country of the Sun: Southern California, An Informal History and Guide. New York: Thomas E. Crowell Company. O’Dell, S. (1961). Acceptance paper. The Horn Book Magazine, 37, 99-104. O’Dell, S. (1978). Island of the Blue Dolphins. Trumpet Club Edition. New York: Dell Publishing Co.
O’Dell, S. (1990). Island of the Blue Dolphins. With illustrations by Ted Lewin. Boston: Houghton Mifflin Company. Payment, S. (2006). Scott O’Dell. New York: Rosen Pub. Group. Reese, D. (2010). Bestsellers in Children’s Native American Books. Pullar, G. L. (1996). Alutiiq. Native America in the Twentieth Century: An Encyclopedia. New York: Garland Publishing, Inc. Edited by Mary B. Davis. Scott O’Dell (n.d.). More about Scott. Shanley, K. W. (1997). The Indians America loves to love and read: American Indian identity and cultural appropriation. American Indian Quarterly, 21(4), 675-702. Stevenson, D. (1997). Sentiment and significance: The impossibility of recovery in the children’s literature canon or, the drowning of The Water-babies. The Lion and the Unicorn, 21(1), 112. Tarr, C. A. (1997). An unintentional system of gaps: A phenomenological reading of Scott O’Dell’s Island of the Blue Dolphins. Children’s Literature in Education, 28(2), 61-71. Tarr, C. A. (2002). Apologizing for Scott O’Dell: Too little, too late. Children’s Literature, 30, 199-204. Wilkinson, C.F. and Biggs, E.R. (1977). The evolution of the termination policy. American Indian Law Review 5(1), 139-184. Update, June 17, 2016: Bridgid Shannon, a colleague in children's literature, pointed me to the Lone Woman and Last Indians Digital Archives, a page maintained by the National Park Service. Do take a look! Lots of terrific info from a team led by Sara L. Schwebel. Update, June 19, 2016: Lauren Peters, a fellow member of the American Indian Library Association, sent me her review of Island of the Blue Dolphins. She posted it in 2013: Defending the Aleuts in Island of the Blue Dolphins. Update, September 24, 2018: Professor Eve Tuck's response to this article consists of a series of tweets. Her thread started at 8:07 AM on September 23, 2018. I appreciate the thorough analysis that @debreese has done here. As an Aleut person, I can say that the inaccuracies depiction of Aleut people in this book meant that non-Indigenous people said a lot of painful and ignorant things to me, especially as a kid. I was a kid growing up in a white rural town in Pennsylvania, and usually ours was the only Native family in the community. I attended a school that had multiple copies of this book in classrooms, the library. I remember there even being a door display of this book. So I grew up in a white community that only knew of Aleuts (Unangan) from this book. I was taunted for it. I was asked by children and teachers to explain why Aleuts were “so mean.” And no matter what I said about my family, especially my grandmother, it wasn’t believed. The book was believed over my real-life knowledge of Aleut people. Fictionalizing an Indigenous community to make them the violent device of your plot line is a totally settler thing to do. O’Dell had no business writing a word “about” our people. The book says nothing about us. Like Gerald Vizenor’s analysis of the figure of the ‘indian,’ it says more about the violent preoccupations of the settler, and says nothing about Unangan. The last thing that I will say is that when I think about colonial violence that Aleut people were *actually* experiencing in their/our homelands in the time period that the book was set, it makes me doubly angry about the falsehoods depicted in this book. But that would never be a best seller. Debbie--have you seen Cammie McGovern's JUST MY LUCK? Critically acclaimed author Cammie McGovern's middle grade debut is a powerful and heartwarming story that will appeal to readers who loved R. J. Palacio's Wonder, Ann M. Martin's Rain Reign, and Holly Sloan's Counting by 7s. Just My Luck, the librarian wrote, references Indian in the Cupboard. There's a copy in my local library. I'll pick it up, read it, and be back with a review.